A few months ago I read (and reviewed) the book A Harvest of Hope. I really enjoyed the book, which took place in a fictitious town in the Red River Valley in North Dakota. 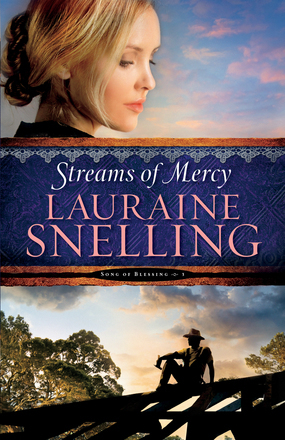 When I was offered a chance to read Streams of Mercy by Lauraine Snelling, the third book in the Song of Blessing series, I remembered how much I enjoyed the Norwegian speech and names, and went for it. First off, it was wonderful to pick back up with the stories of the folks who were the main characters earlier in the series. It took a chapter or two for me to pick back up on who is who, and to sort out all of the old-fashioned names. What I had forgotten, though, was that Miriam, the main female character in the last book, had just lost her mother, and reading about that right after my mom died had been hard. Miriam is now a about where I am. It's been awhile since her mother died, and she's picking up her life, yet still missing her. I'm glad that wasn't the main story. The main story involved a young widow. And a diphtheria epidemic. Doesn't that sound upbeat and cheerful? It actually is a wonderful book, and I'm glad I read it. Reading about these strong immigrants and how they deal with the various difficulties they encounter, well, it makes me stop and think about where I really do place my trust and about what does really matter. Although this is #3 in a series, this book definitely can stand alone. I don't remember Anji being a part of the earlier books at all, although Thomas certainly is. I'll have to go look for that. I always love a trip back to Blessing and it's nice to see some new stories come out. Lauraine's series was one of the first I read back in the day.